Coventry Cathedral West Screen by John Hutton, engraving on glass, completed in 1962. Courtesy of the Coventry Society, Coventry, United Kingdom. Currently on display in the exhibition Function & Fancy – Decorative Arts from the Collection and Beyond is a vase engraved with two ethereal flying angels blowing horns. The vase, at just over 40cm tall, is made from clear hand blown crystal and engraved by artist John Hutton. The angels on the vase are from Hutton’s best known work – the great West Screen of Coventry Cathedral, United Kingdom, completed in 1962. John Hutton was born in Clyde, in the South Island of NZ, in 1906 and attended Wanganui Collegiate School from 1920-22. After studying law for several years he abandoned it to take up painting despite not having any formal art training. In 1935 he moved to England with his first wife Nell Blair and became interested in mural painting, working for the Paris Exhibition in 1937. After serving in the Second World War as a camouflage officer, he continued working on large-scale painting commissions throughout Britain. In 1947 he designed his first large scale glass engravings after which he focused mainly on glass engraving. His first marriage ended and in 1963 he married Marigold Dodson, the model used for many of the figures in his artwork. During the Second World War, on 14 November 1940, Coventry’s Cathedral of St Michael was destroyed by Luftwaffe bombs, along with much of the city. 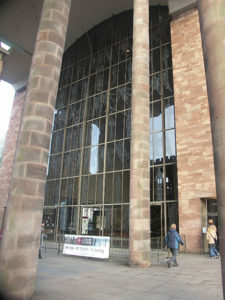 Today Coventry Cathedral consists of two buildings on one site: the ruins from 1940 and the new building, consecrated on 25 May 1962. The architect of the rebuild, Sir Basil Spence, commissioned work from some of the finest artists in post war Britain, including Graham Sutherland, John Piper, Jacob Epstein and John Hutton, who knew Sir Basil Spence from his war years. 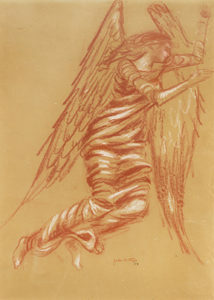 John Hutton ‘Flying Angel, Design for Coventry Cathedral’ 1954, coloured conte crayon on paper, 1966/2/1. Collection of the Sarjeant Gallery Te Whare o Rehua Whanganui. Purchased by Dr. H.D. Robertson on Gallery’s behalf, 1966. The West Screen is a towering clear glass window 21.5 metres high and 18.85 metres wide which depicts 66 figures of saints and angels. 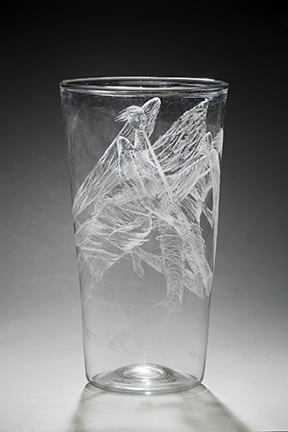 Hutton invented an entirely new glass-engraving technique for the project which took 10 years to complete. To develop the designs he completed pencil drawings of Marigold, draped only in a silk bedspread, followed by white chalk drawings on black paper the size of the glass window. The glass pane was placed over the chalk design and engraved using Hutton’s own hand-made tool, made out of an old washing machine motor fitted with a flexible drive shaft, on the end of which he would put different sizes and grades of grinding wheel. Initially Hutton planned to include saints and angels alternated in every other window but felt it was too regimented so broke it up with dancing angels creating a sense of movement and jubilation across the screen. When asked by the Bishop of Coventry whether he believed in angels, Hutton replied “I don’t know that I do really, but I certainly do believe in them as an enormous help in designing such a thing as this”. John Hutton loved his work on the West Screen and when he died in 1975 his ashes were buried at the foot of the window he created. The Flying Angels vase currently on display is one of a limited edition produced to raise funds for the Cathedral rebuild and was purchased by the Gallery in 1962. Other items by John Hutton in the collection include two Coventry Cathedral chalk drawings of Saint Chad and an Angel. There are also several drawings in the Wanganui Collegiate School Museum collection. The exhibition Function & Fancy continues until 21 May 2017 above the i-SITE at 31 Taupō Quay.